Today’s tube strike meant that any exciting plans we had for dinner where shelved fairly quickly since both of us got home too late and too tired to do anything other than the bare minimum. 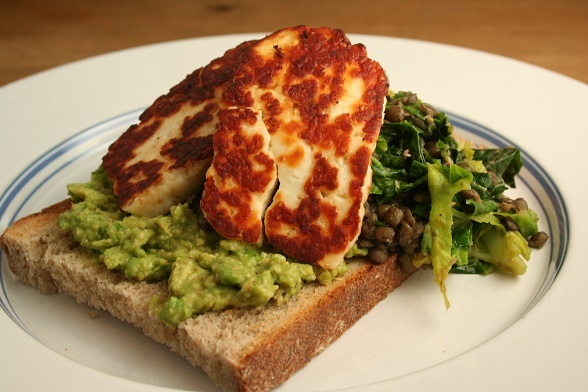 The lentils, avocado and halloumi we had a couple of weeks ago was a huge success and it was the first thing we both thought of when we realised we needed something quick. We had some lentils in the freezer which just needed heating up while we mashed an avocado, fried the halloumi and toasted some bread. What I really love about this is that it tastes like so much more than the sum of it’s parts, which are essentially leftovers with some avocado and cheese added. And it’s incredibly forgiving: no avocado? Skip it then, it’s just as good without. No halloumi? Of course, almost everything is better with cheese but the lentils work so well with the avocado and toast that you won’t miss is desperately if you don’t have it. You could even leave out the bread if you wanted to although I think it makes all the difference.